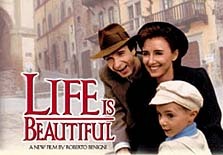 Benigni in Life Is Beautiful. Roberto Benigni won his Best Actor Oscar for his poignant, humorous portrayal of a carefree Jewish book keeper, Guido Orefice in 1930's Italy, who marries a beautiful school teacher, Dora and lives happily together with their son, Giosue, until Nazi forces arrive in town. Roberto Benigni is also known for writing and directing, which is what he did with Life Is Beautiful. He is one of Italy's leading stars, who also wrote and directed this labor of love. He also won an Oscar for his direction of the film. His father, Luigi Benigni was a prisoner in the Nazi Concentration Camp at Bergen-Belsen, from 1943-'45. His stories of life in this camp inspired Roberto's screenplay and performance. Roberto Benigni is the first one to win the Best Actor Oscar award for a non-English speaking performance in a foreign film, and has joined the ranks of Laurence Olivier, as only being the second person in film history to direct himself in an Oscar-winning performance. Roberto Benigni in Life Is Beautiful.